Not much new on the gaming front here. The TaoLing has been ill, so its pretty much bridge and TV during the winter break. Just added Versailles 1919 to my P500 orders after seeing it on the January P500 Geeklist. (I didn’t care for Churchill, but the theme is intriguing….). I’m vaguely-but-not-really considering the “No Retreat, but even simpler” game from Carl Paredis. (The actual No Retreat Western Front game is also VBNR, even though I’m sure I’d only play it once, if that). How’s the gaming where ya’ll are? Update — I noticed Eric in a QE thread and so I got involved. Did you know I have a chicken that plays QE? (He switched from Boggle, where he earned a minor role in King of the Hill). Anyway, when writing thatI remembered something I read a while ago about Rationality and Newcomb’s Paradox. Don’t mistake me, and think that I’m talking about the Hollywood Rationality stereotype that rationalists should be selfish or shortsighted. If your utility function has a term in it for others, then win their happiness. If your utility function has a term in it for a million years hence, then win the eon. I could roll the dice on a few things, or perhaps try a COIN, … what are you getting (or would get, if you didn’t have already)? (See the 18 Oct update for more info). Nothing (gaming wise) interests me more than the previews for Dominion: Nocturne. This looks to be an excellent expansion. Dominion is one of those games that rarely gets played, but is steadily good and continues to have new ideas and argument #1 for varietal expansions. Also, Halloween is almost ‘pon us and I haven’t been to the game club/store since summer, so I have no idea if anything else good has arrived/is around the corner. The live band at the beach bar last night mainly did the stuff you’d expect a live-band to do, but their Instrumental mashup of The Entertainer (as made famous by the Sting) and the Mario Brothers Theme was actually amazing. Also, my sister-in-law is friends with some of Fragile Rock, which is may be a truly great band name and a truly horrifying idea. But the best band name that I heard of last week (in the Bowie book I’m reading)? Gaming at the beach? I did learn Mexican Train (possibly correctly, possibly not). Also played a game of Scrabble (your bingo challenge rack is — ehikost) and some Boggle. But overall not much gaming. 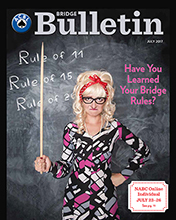 I did read the latest bridge bulletin, although judging from the cover you would think that bridge is a chore and burden. Perhaps the ACBL is actually composed of people who have managed to construct a derivative that allows them to short-sell bridge. (This is not the first time I’ve had that thought). Anyway, I’m now back from “second vacation”, which probably means I should not game and go back to work. We’ll see. Anyway, I come back to the country I see that Scott has pointed to a review by Samzdat and that is quite useful for people on both sides of the political discussion, as it tries to explain the phenomenom of increased political divisiveness even in an improving society. (It does this by introducing the concept of legibility to the conversation, and goes in a surprising direction that seems correct, at least on first glance). Anyway, this may be of interest. I’m definitely going to be reading through Samzdat. The article on Polyani’s Great Transformation extends this further (and contains some very interesting thoughts on economics that, strangely enough, I just encountered in Paradise Lost). And the next book to be discussed is Hoffer’s The True Believer, which I did read (30 years ago, vhoj’ha moi! ).